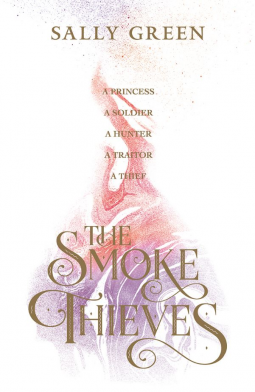 Review: The Smoke Thieves | Live to read. Read to live. It continually surprises me, actually, how much of a little fantasy fan I’ve become. I can remember when I was growing up and my Dad used to read all these sci-fi and fantasy novels and I was all WHY WOULD I WANT TO READ BOOKS ABOUT DRAGONS AND MAGIC AND PLACES THAT AREN’T REAL AND THINGS THAT COULD NEVER EXIST and now I am all grabby hands for all of those things. Anyhow. In that vein, let us talk today about the first in Sally Green’s new series The Smoke Thieves. Sidenote: you may have heard of Sally from her Half Bad trilogy, and if you haven’t, well, you should get on that. S’good. So The Smoke Thieves is new, and it’s about a princess preparing for a political marriage, the guard she’s in love with, a servant hungry for revenge, a boy who isn’t sure what he wants to do with his life and steals things just because he can, and a thirteen year old girl who spends her life being bait for a demon hunter. I KNOW, RIGHT? ALL THE GOOD THINGS. I could not get enough of this book. I loved it. I mean sure, there’s a lot going on here and there are so many protagonists so I’ll admit I was a little bit scared it was going to be too much but actually it totally worked, and I loved them, precious little flowers that they are. Princess Catherine for example is EXCELLENT. She’s headstrong and loyal and opinionated and in this pretty rubbish male-dominated world she lives in, she’s not afraid to ask questions. Tash is so precious although she’d kick you in the shins for saying it; she’s old before her time that kid and you ache for her. She’s also hilarious. As for March and Edyon. ALL THE FEELS. I am ambivalent towards Ambrose, which might be terrible of me but he was my least fave and I wished Catherine would stop going on so much about how much she loved him. I WANT DEMON HUNTING AND CUTE BOYS KISSING DAMMIT. This cliched romance between princess and guard, whilst vital, fell a bit flat. And actually now I am thinking about it, that is my issue – I like Ambrose and he has the worst luck so he does not deserve this from me, I just don’t think I like him with Catherine and so much of his story was their pining and he did not have the same amount of excellence as she did and so did not keep me engaged. The story switches between each of the five and whilst it starts off as separate threads you realise pretty quickly that these stories are going to overlap and I am so here for that you don’t even know. It’s so clever and well thought out and the world-building here is spot on and we all know how I live for that. The character voices are all really distinct too so I never felt like anybody was interchangeable which can defo be thing when you have so many people telling a story. I was one hundred percent engaged pretty much the whole time and I ended it wanting to have a small tantrum because I want book two right now. Overall, then, I loved this book, I loved it and I’m super looking forward to book two for sure and with the exception of Ambrose (sorry dude) and the fact there was a lot of unnecessary F-bombing - which doesn’t bother me, I have no problem with swearing but I noticed here which makes me think there must be a lot and I kind of wondered why – this is a pretty solid start to a series and a great break away from the supernatural Half Bad. It isn’t perfect and it’s by no means the best writing ever: it’s flawed and now I’ve sat down to talk about it, I’m remembering the things that made me sort of grimace a little bit, like the swearing and the sometimes clunky writing and the fact that some narratives were more fully fleshed out than others, but wow I was so engaged and I couldn’t put it down and I just…all faults aside I really really liked it. I LIKED IT. And the copy I have is SO PRETTY. The cover is all pastely and it has coloured edges and I swoon.